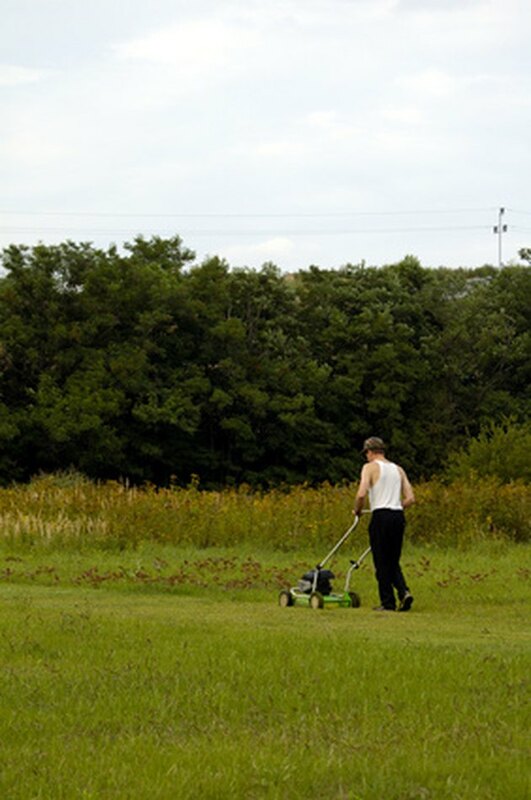 Lawn mowers, whether ride upon or walk behind, are built to cut grass quickly and efficiently. Still, even the most durable outdoor appliances can sometimes experience difficulty running during operation. In fact there are several reasons why lawn mowers might start to run slow or even stall out, and there are several solutions to try before calling the repairman. Several factors can affect the running speed of a lawn mower. Because a lawn mower is powered by a combustion engine that is powered by liquid fuel, clogging is a major issue that slows down or even shuts down performance. In fact clogging can occur in many areas of the lawn mower, including the fuel line, the gas cap, the carburetor, the "needle and seat" and the air filter. Disconnect and ground your spark plug wire before performing any maintenance on the lawn mower, and inspect each source for clogs, blockage or dirt. If the paper outer filter is dirty, clean it with compressed air or replace it. Clean the foam inner filter with dishwashing liquid and water. Gas caps and "needle and seat" apparatus are better replaced than cleaned. Each gas station or fuel supplier employs a different blend of fuel in their tank even if the fuel is of the same octane. Additionally, many fuel providers also use gasoline blended with corn alcohol (ethanol) to reduce cost and environmental impact. These variations usually have a minimal effect on large vehicles, such as cars and trucks, but can wreak havoc on smaller, more delicate engines like those of riding or walk-behind mowers. If your mower is experiencing reduced performance, especially with a few stalls, the fuel blend is probably not the best for your lawn mower. Far from presenting a minor problem, the wrong fuel can take years away from your engine's life span. Use fuel from a different provider. For self-propelled walk-behind and even electric lawn mowers, a loss of drive can mean a bad battery, a motion drive belt fault or even air trapped in the transmission. Examine the battery for low power after a full night of charging. If the battery still registers as low, replace and fully charge it before trying to use the mower again. If the problem is not solved, inspect the motion drive belt for signs of wear or damage. If the motion drive belt is in good order, take the lawn mower to a professional service center for help from a certified technician.